Hypnotism is used every day without people's realisation. Marketing and advertising are classic examples of its application. Repetitive television commercials are particularly effective as repetition is a key element in hypnotism. It is quite likely that those television channels with the least advertising subscribers will be the most effective channels as the same commercials are repeated frequently, usually at 15 minutes intervals. When I was young supermarket music was literally that-muzak. Indeed the subject of muzak is deserving of a study in its own right. It is a tool that used to be used to induce a light hypnotic trance in shoppers to make them more receptive to suggestion-the suggestion being to buy more products! These days instead of employing muzak which in my opinion is not at all unpleasant to the ears modern pop music is used and much of this is of the vulgar variety. Instead of inducing a trance I find the whole ear splitting experience an annoyance, so much so that I attempt to get my shopping done very quickly! It is possible that modern day supermarket managers fail to understand the purpose of background music, thinking instead that their customers should be 'entertained'. What a pity then that they do not take into account the fact that a quarter of the population is over 55 and do not need what is left of their hearing to be bombarded by ear splitting noise! So clearly they have not grasped the concept of true supermarket muzak. Modern pop music does not have the same intended effects. The above mentioned are examples of how the techniques of inducing a light hypnotic trance are used in the fields of commerce but it is used to most startling effect in the world of politics. It is difficult to know when these techniques were first employed by politicians but one can say with certainty that THE most effective political hypnotiser in the modern era was Adolf Hitler. It is said that his presence had a mesmerising effect on both people he encountered on a one to one basis and also on the massed crowds of supporters. There are many historical accounts of down hearted generals being revived by spending just a short time in Hitler's company. I would suspect that Hitler knew that he had this gift. His talents in this field cannot be disputed. I imagine Wotans Kriecher wearing a horned tin-foil hat. Probably goes together perfectly with Wooden Mjölnir. As if you ever leave your house. Did Hitler use supermarket musak? This is one of those little details that history fails to note. And now all I can imagine is Hitler's Reichstag speech in '39, backed by an instrumental version of "The Girl From Ipanema." 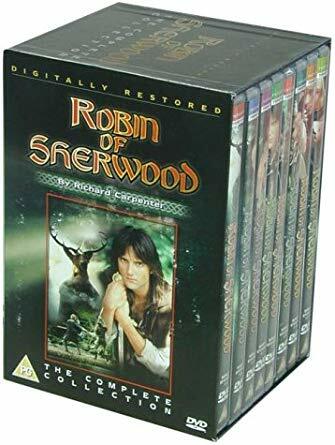 The theme of "Robin of Sherwood" is hypnotic. Doing more than a video projector connected to your DVD player much, Smelly?! as the same commercials are repeated frequently, usually at 15 minutes intervals. It's because companies buy advertising during a particular program, and the commercial breaks are generally every 15 minutes or so. Has nothing to do with hypnotism, it's just how the television industry works. Someone else who likes muzak! I thought Andy Warhol was the only person in the world who'd ever admitted to doing so, but no, this Nazi pseudo Norseman does as well. I'm sure he and a gay New York pop artist would be thrilled to be lumped together. So, do the commercials make you want to buy some soap and shampoo yet? Garbage Krieger? WK's website has been removed. Hopefully, he's gone to take a shower.